In this article, we'll explore the answer to the question every owner of a private country house: "How to build a henhouse with your own hands"? Moreover, many householders want to properly build a chicken coop, and even in a short time. However, quickly and correctly to build a henhouse with your own hands is quite real, and it does not have to be a professional Builder. So, go to the bottom of it. - choose a hill to a place for the chicken coop was well ventilated. This will avoid excess moisture and the accumulation of moisture from melting snow. Yes, and the paddock for the chickens will be easier to build. take into account the Sunny side of the world, with the location of the house. Have a chicken coop so that the maximum light fell in through the Windows of the coop during the day. Because the duration of daylight affects the ability of chickens to lay eggs. - the peace and tranquility birds, in our case the chickens is an important factor that affects the quantity and quality of egg laying. Chicken does not like noisy places and therefore, choose a quiet place away from the roadway. - it is important when choosing future locations for the coop to consider the size and dimensions, and also to reserve space for range chickens. It is recommended to do a spacious interior, the bird will make it hurt less. 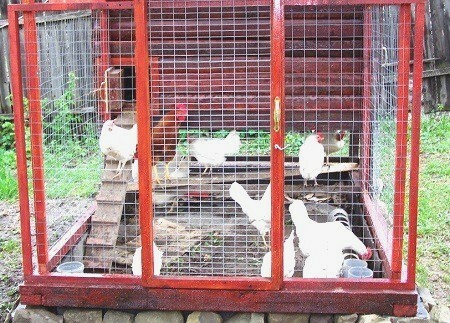 On average, 1 square meter of placed chicken coop 2-3 chickens. So, with space for the chicken coop, we decided, and now you need to decide what materials to build the coop. There is a wide range of materials that can suit everyone: brick, gas silicate blocks, wood beams planks. The most correct and efficient will be the construction of coop based on timber and boards. 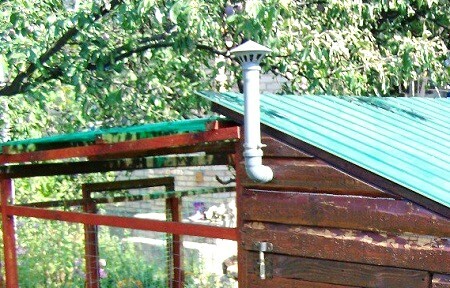 This type of coop is built much easier and faster than from bricks or blocks. 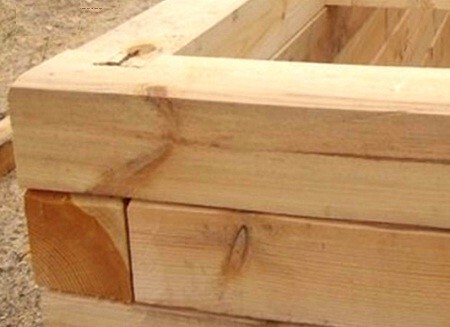 Another important advantage of a chicken coop made of timber – is the use of pile (columnar) Foundation, which will allow you to save a lot of money. The coop is built of timber easy, and requires pouring lanciato Foundation. 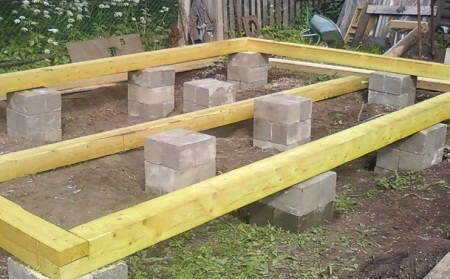 The first step is to lay out and prepare the Foundation for the coop. The markup for the Foundation to do just elementary. Take the valve rods and sticking them on the outer corners of the coop. Then the bars of the stretched rope or cord construction for reference. Use the tape measure to measure the length, width and diagonals of the Foundation of the house. The Foundation for the chicken coop we chose columnar type, so on earth, starting from the corners of the outlined squares of size 0.5 by 0.5 meters in width. They need to be done at a distance between 1 meter (distance between beams). Dig holes with a depth of 40 – 80 cm the bottom of the pits sprinkle with sand, it serves as a cushion against the effects of ground movement due to frost. Next, using the mixer knead the concrete and pour the Foundation. The solution is usually done in the following proportion: 1 bucket cement M400, 2 buckets sand, 3 buckets of gravel. Waiting for drying of the concrete is 2-3 days. Then you need our Foundation to raise above the ground to a height of 20-30 cm For this we need sand-lime bricks. As we filled the pillars with a width of 50 cm, it is under the length of 2 bricks. Lay bricks with cement mortar Foundation. To display zero used hydraulic or laser level. Initially, the Foundation is laid roofing felt for waterproofing walls and floors. Falls first crown from a bar (usually of size 100*150 mm) and joists for the floor. At the corners of the beam connected to each other, for this advance cut the gusset in half the thickness of the timber. The joists of beams 100*150 mm are placed on the edge for rigidity. The distance between the joists is usually not more than 1 meter. Next, the first row of the wall of timber placed a pad of linen. This will avoid gaps between the rows of timber, taking into account possible shrinkage and deformation. The second and subsequent rows of timber are stacked and joined at the corners between them. Commonly used type of connection the tongue into the groove. You can apply and iron brackets to reinforce the corners. The Windows in the coop make small and place them on the Sunny side. The hole for the chickens, so the chickens can exit the coop is at the bottom of the wall. If in the winter time on the floor in the coop will be used for insulating filling (sawdust), then a hole can be made higher from the floor to the height of the planned backfill. It is desirable to make the fence manhole from the wind or vestibule which will serve as a buffer from the cold. The choice and construction of the roof of a fairly creative process. The simple shed roof. But when using the saddle – we have a attic where I store all sorts of things, tools and food supplies. Therefore, choose a gable roof for chicken coop. On the walls lie on the edge beams at a distance of 70-90 cm between them. Beams are attached to the walls with nails and screws. Then made a frame system with timber 50*100mm or 50*150mm. Sheathed rafters of the roof sheathing or boards. Ready to frame the roof of a chicken coop can be covered with sheets or other available material such as a roofing material. The ceiling of the coop is made from boards in the thickness 20-25mm. Beams are sheathed on the bottom boards. Then insulated the ceiling with mineral wool or URSA. If money is tight, you can do a simple sawdust, or expanded clay. Then nail the top Board to the ceiling joists. 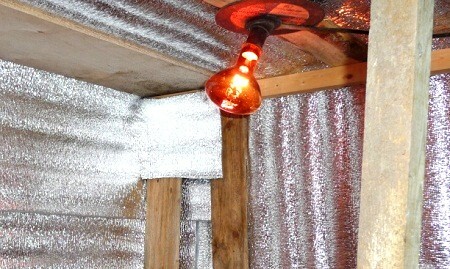 Ventilation in the chicken coop made of conventional plastic pipes, which are mounted on the ceiling in different parts of the house. With the help of the air pipes you will be able to change the temperature inside the chicken coop. The pipe is inserted in the adjusting plug. In winter the ventilation pipe of the coop block. In summer, for ventilation, you can open the Windows. The floors in the coop should be warm and protected from the wind. 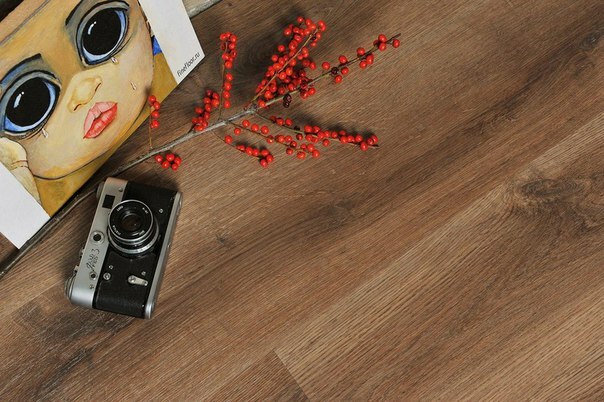 Flooring made from edging and not edging boards is 20-25mm. The bottom layer of the floor is upholstered neobreznye boards. On these boards we Staley hydro-vapor barrier and put the beam 100*100mm at a distance of 70-80 cm between them. Pour the vapor barrier into the insulation, at your discretion. On top of the timber floors are cut the Board close to each other. Thus, we get quality flooring for the chicken coop with natural ventilation that will not rot. 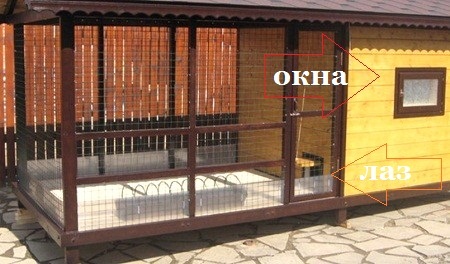 So, how to build a chicken coop, it has been described above with all the details. Now we need to start the internal arrangement of the house. Among the main internal elements of coop are: a roost for hens nights, places for laying hens (nests), feeders and waterers. 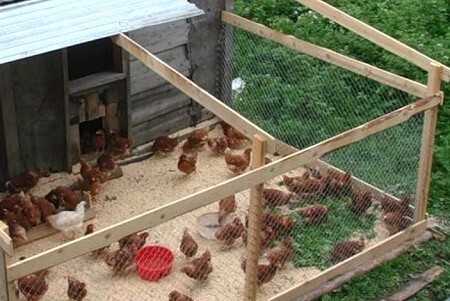 Proper placement of the perch will allow your chickens to be clean and healthy. The roost is made from bruskov 30*50 mm. In average one chicken needs about 30 cm long perch, based on these numbers, calculate the total length of the roost. If the length turned out great, it is better to use a stronger beam 40*60 cm Roost for chickens to have a height of 60-90 cm from the floor level. It is impossible to make perch one above the other, as the chicken on top will get lower kuram, and all droppings will fall on them. To have in your coop have eggs, you have to equip the coop with boxes for laying hens. Such a box or nest made of conventional plywood or boards, to the inside of the nest is spread hay or straw (sawdust). Boxes for hens to be set in a quiet and secluded shady spot so the hens feel safe and comfortable. This place are usually the corners of the house. Feeders in the coop are best placed at some elevation from the floor. It is necessary to carry out digging into them painfully, the chickens like it. For the convenience of the coop under the perches can be placed trays for the litter, it will save time on cleaning. The floor of a chicken coop sprinkle sawdust – this will also facilitate your work for the care of cleanliness, and in winter the chickens will be warmer. It is possible to provide a sloping floor – another plus in cleaning. In the winter, chickens need somewhere to go – make next to the chicken coop range. Walking can be done in plain fence of poles and mesh netting. But if the range is under cover, then your chickens will walk in any weather. Also, in extreme cold, you can hang special infrared heating lamp in the coop. If the lamp is low, make around it a frame of wire, so the chickens didn't get burned.